Tara's Bit of Whimsy: Hatcing chicks? 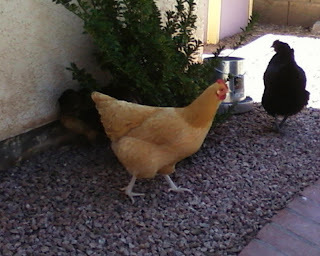 Dandaleen, our big yellow chick has been displaying some really strange behavior lately. She lays an egg and stay on it in the egg box all day. Every time we go to get the egg, she puffs her self up until she is twice the size of her normal chicken self. We think she is brooding--trying to hatch some eggs. Sorry sweetie, you don't get to be a mommy. We need a rooster for that. The behavior lasted about a week, and then she stopped the antics.